With the rapid development of aquaculture, its economic benefit has become better and better and its farming types also increased gradually, therefore, various aquatic feeds, in particular for floating extruded fish feed pellet, rise in response to the proper time and conditions, which makes fish feed production become a way for people to enrich. Because aquatic animals like fish and shrimp have small intestines and stomach with bad digest and absorption ability, the manufacturing process of aquaculture feed has much higher requirement than that of livestock feed, which means it’s very important to choose suitable fish feed processing equipment to produce aqua feed. 1. Small particle size. Due to short intestines and stomach and other physiological properties of aquatic animal, in order to accelerate digest and absorption, the fineness of pulverization of aquatic feed should be smaller than poultry feed. For example, when producing eel feed or prawn feed, the particle size should reach 80-120 meshes. 2. High protein content and low carbohydrate. The protein content of livestock feed is often less than 20%, while that of aquaculture feed is always 30%-40, and thereinto green turtle and eel feed protein content is up to 65%-70%. 3. Pellet feed structure is compact, with higher cohesiveness and water resistance. For instance, prawn feed requires the water stability of pellet feed up to 2 hours. 4. Cross contamination should be strictly forbidden during the process of aquaculture feed production. Some raw materials need to get through aseptic processing, so the selected device should be convenient to clean and have few reminder, especially when producing prawn or eel feed, do not produce other type feed, avoiding cross contamination. Generally speaking, for common fish feed production, the requirement on material granularity is about 40-60 meshes, but for producing particular kind aquatic feed (such as shrimp feed and eel feed), the particle size of raw material must reach over 80 meshes. As is well known, material granularity decides surface area of feed composition, so the thinner granularity, the larger surface area, the stronger ability to absorb moisture in steam before making pellets, which is conducive to tempering and pellet shaping with good stability in water and good absorption effect, and also prolonging standing time in water to promote feeding return and lower water quality pollution. 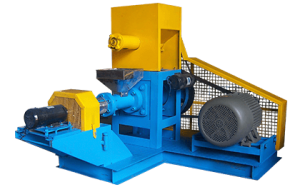 In order to get perfect mash particle size, the old common hammer crusher has been no longer applicable for fish feed making, but fortunately, the current popular droplet fish feed crusher, lunched by FANWAY Fish Feed Machinery, a leading professional aquaculture feed processing equipment manufacturer, has unique design and advanced crusher type with two clearance between the hammer and sifter for ordinary pulverization and fine crushing respectively. The granularity crushed by this aquatic feed machine is more even, and the fine grinding particle size is more in line with fish feed production requirements. 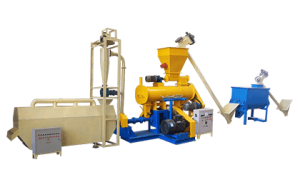 Therefore, once put into the market, FANWAY droplet fish feed crusher machine has been deeply favored by lots of feed plants and fish farmers. As one of the key equipment and important section of feed plants, the performance property and using effect of fish feed mixing machine and distributing mixing system directly affect the production efficiency and product quality of feed plants. With the rapid development of batching scale and electronic technique, only choosing perfect mixer to make mixing machine production cycle equal to batching scale can ensure the productivity of this section be its best, thus effectively ensuring mixing effect, promoting yield and lowering cost. For purpose of achieving this goal, FANWAY has produced the new type fish feed mixer with high quality stainless steel and helical ribbon. With fast speed and high productivity, this mixing machine also has strong wear resistance and long working life. Adopting unique design, it can make materials combined cycle and uniform blending during whole mixing process without breaking original physical condition of materials. Fish feed production requires higher degree of gelatinization and water stability, so the selection of extruding machine needs to reinforce tempering condition. Through prolonging materials tempering time, starch gelatinization under high temperature can strengthen adhesive property of feed pellets, kill Salmonella and other various harmful bacteria, ensuring that pellets with smooth and clean appearance are not easy to be eroded by water, which not only promotes the water stability of fish feed but also improves the palatability and digestibility of feed. Moreover, the usage of fish feed extruder can make sure fish and shrimp have longer ingestion time, and prevent water pollution caused by feed pellets. During the extrusion process, raw materials would be processed via high temperature, high moisture and high pressure, so at the moment that feed pellets are extruded from die hole, the stress drops sharply and the water content in feed emits from liquid state to gas state, resulting in extruded fish feed. 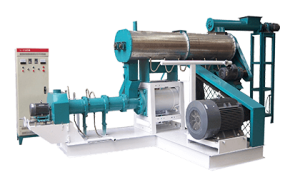 In a word, it is better to choose dry type fish feed extruder for small or medium scale feed production and select the wet type one for medium or large scale fish farm or feed factory, and the difference between these two is that the wet type is equipped with a boiler that can steam the materials when producing pellets. The purpose of drying feed is to remove the superfluous moisture in feed so as for better and easier packaging, transportation and storage. According to the composition and characteristics of fish feed, Fanway recommends mesh-belt type fish feed dryer for fast and high-efficiency drying process. With multiple layer structure, this drying equipment has good security and operation flexibility, easy to install and maintain. What’s more, it supports enclosed drying process, bringing uniform drying effect and avoiding dust spillage effectively.